2 x Immersion’s on one circuit. So it looks like I’m going to need to get two 16amp immersion’s circuits into the plant room. Currently it’s just one fed from a 2.5mm radial on its own 20amp RCBO. The cable run is pretty short only about 4m. I think technically the RCBO needs to be 40amp as the circuit would have two 20amp double pole switch. Firstly, the RCBO is primarily there to protect the cable running from it, so needs to be a lower current than the maximum rating for the cable, allowing for derating factors that are determined by the mounting and location of the cable. A ring final is not a good idea, or normal practice, for a heating circuit, it needs to be a radial. Two immersion heaters will draw less than 30 A in practice, under any condition, but 30 A is above the rating for 2.5mm² T&E cable when clipped directly (maximum is 27 A if there is no insulation around the cable). 4mm² T&E is rated at 37 A when clipped directly (installation type C), but that drops to 27 A if it is behind plasterboard that has insulation against the cable (mounting type 100), so before determining the cable size the mounting method needs to be known. If you can run the cable using either type A, B or C mounting, (in conduit, enclosed in conduit in a wall or clipped directly), then 4mm² is OK, but the RCBO needs to be 32 A, not 40 A, as 40 A isn't a low enough rating to protect the cable. Then if one goes down it won't affect the other. One 32a / 4mm2 cable and split them locally. Don't know what his earthing system is but it might be advisable to run that 4m of cable in "earthed metallic" something as it won't be rcd protected if off a breaker. Pedantic? The 2800 w is an EU rating anomaly I think, 2 x 2800 W at 230 VAC, is 2 x 3047 W at 240 VAC, and 240 VAC is still our nominal mains supply voltage, despite it being officially labelled as 230 VAC. We fudged EU compliance by creating an asymmetric supply voltage tolerance, of +10%, -6% on the nominal 230 VAC that the EU demanded, so we didn't have to go around changing all the local distribution transformers or adjust their taps. When calculating cable sizes it's better (and safer) to ignore the 230 VAC power rating for resistive loads like heating elements and assume that the supply is still really 240 VAC, as most of the time it is. This makes a small, but significant, difference to the current drawn by any resistive load, plus it's sensible to allow for the current drawn by the heating element under worst case conditions, especially in an installation where there is PV fitted, as that will tend to increase the local supply voltage above the nominal 240 VAC. Our supply often limits at the 253 VAC upper tolerance voltage when it's sunny, for example, as all three houses on our supply phase from the local transformer have PV systems. The 2800 W at 230 VAC rated element in the Sunamp has a nominal hot resistance of around 18.9 ohms, so if supplied with the normal 240 VAC supply voltage it will draw around 12.7 A and if supplied with the maximum supply voltage (say when a PV system is running well) then the current drawn increases to about 13.4 A. The 2800 W at 230 VAC element will run at around 3386 W at the maximum supply voltage of 253 VAC, or around 3047 W at 240 VAC (so the heating element is, in reality, a 3 kW one). If it were me (assuming this is an all RCBO set up, with no RCDs in the box), then I'd just fit a 32 A RCBO and a run of 4mm² T&E to a small CU with two 16 A DP MCBs near the Sunamp installation as the isolators. It's then fine to run 2.5mm² cable to the Sunamps from there. If its trunked then it'll have the additional degree of mechanical protection plus the PVC/PVC so should be fine. Other than that it should ( IIRC ) be in SWA if run integrally? Trunking or conduit is certainly better than clipped direct, but unless it's in area where heavy mechanical damage is a possible risk there's no need to do more. Just protect the circuit with an RCBO (I'm assuming that the existing CU is an all-RCBO one) and that'll be fine. Providing overload protection at the point where isolation is required, and where the circuit splits into two 16 A supplies, makes sense, as a DP MCB can give both the required overload protection and act as an isolator switch. SWA is a PITA in terms of termination, so I'd not consider it unless there was no other option. If there is a need for a high degree of mechanical protection then steel conduit is easier and neater to fit than SWA, IMHO. In an isolator + MCB CU, where all the other circuits are RCBO’s , is SWA not required to take unprotected services through a domestic dwelling? 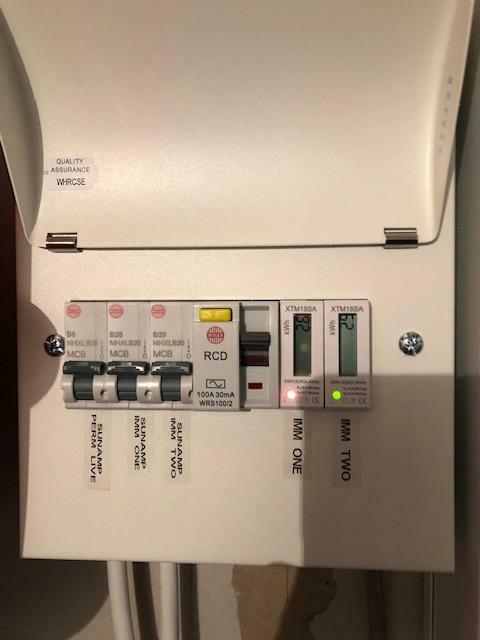 Just recall seeing a spark take a SWA through to a lighting control system where the box of tricks was sporting RCD + multiples of 2a MCB’s, but then obviously the spark couldn’t take an RCBO to an RCD so therefore had an unprotected cct traversing the property. The RCD requirements are for most final circuits, and circuits buried less than 50mm deep in a wall. So you could run a submain on the surface without rcd protection, but not many people would like that, so often the easiest way is SWA buried where possible The earthed metal covering obviates the need for rcd protection just as steel conduit does. Job done as per the recommendations on this thread. I'm not so happy that the 4mm cable seems to run "warm" when pulling for both immersions. Is that normal? You could slap a clamp meter on an d see what the cable is taking in reality if worried.What's the nominal A requirement quoted for the Sunamp's permanent live? The permanent line is internally fused at 3 A. The heating element switched line runs a 2.8 kW at 230 VAC heating element, so around 13 A at 240 VAC. I doubt that the permanent line current ever gets over around 100 mA, despite being fused at 3 A, as all it runs is the 6 W nominal control circuitry plus the relay that switches the heater on and off. Two Sunamps charging at the same time will draw around 26 A or so, well within the rating for 4mm2 T&E, clipped direct, and just about OK for 2.5mm2, although too damned close to be used in practice.